We are off to spend a few hours by the seashore, but I wanted to leave you with a couple of pretty things that I found this week throughout my travels in this abbreviated round-up. Beautiful yellow wedding flower inspiration from Boho Weddings. I thought this sweet as tea engagement shoot was pretty adorable. From Savvy Deets Bridal. For our DIYers out there, how about these wine glasses made out of wine bottles? From Valley and Co Lifestyle. 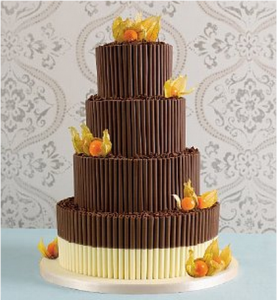 Wedbits, The Dessy Group’s Blog, has some lovely chocolate wedding cakes. I feature one, made by Marks and Spencer, above. It’s trimmed with gooseberries, which are uber hot right now. 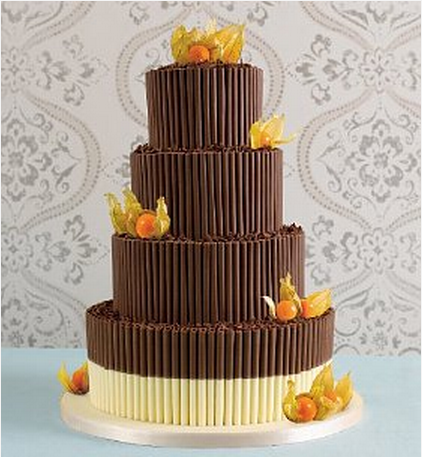 I adore the double height tiered strawberry cake featured in HWTM Party of Five this week! Check out the pic in the top left of the link. Have a safe and Happy Labor Day weekend and a Delicious Week!